Kansas City Catering… A Family Tradition! From a business lunch to your elaborate social event of the year, Two Sisters Catering’s homemade touch and elegance goes into everything we make. Our delicious recipes and eye-appealing dishes have been a Kansas City favorite for more than 10 years. We invite you to learn more about our business catering services and special event catering, explore our online menu, and meet the sisters. Call 816-737-0846 or contact us online today to plan your next event! 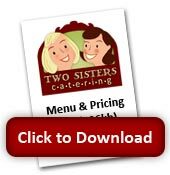 Two Sisters Catering is a small family owned and run business. We truly understand budget constraints. If our suggestions or prices do not align with your needs, please feel free to contact us to discuss how we can accommodate you. In addition to our large catering menu, we have many more recipes and ideas available. Whether you would like to cut down to save money or to dress it up to have a more elegant affair we can do it! Our goal is to make the “catered” portion of your event run smoothly and taste wonderful. Contact us for all your Kansas City catering needs!